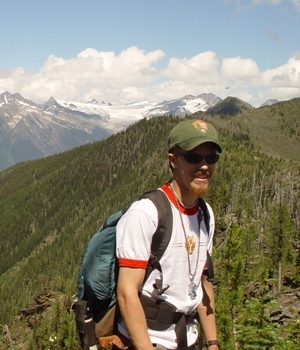 Joel is currently working on his Ph.D. thesis at the University of Calgary under the supervision of Dr. David Pattison, and as part of the Targeted Geoscience Initiative-3 (TGI-3) in southern British Columbia. He received a bachelors degree in geology from Middlebury College (Vermont, USA) in 2005, with an honors thesis focused on bedrock mapping and trace element geochemistry in coastal Maine. Following graduation, Joel worked mapping hot springs and geysers for the National Park Service in Yellowstone, followed by a stint with the National Science Foundation in Antarctica. The latter project, SHALDRIL, conducted shallow drilling on the Antarctic continental shelf to gain information on past climate fluctuations. He began at the University of Calgary in the fall of 2006. The Grand Forks Complex is a fault-bounded metamorphic core complex situated in the Omineca Crystalline Belt, southeastern British Columbia. My project aims to analyze the structure and petrology of the area, focusing on the immediate vicinity around the Kettle River Fault (KRF), an east-dipping normal fault that forms the edge of the complex. Investigations are focused on determining peak metamorphic conditions and dates for the hanging wall and footwall of the KRF, and constraining the amount of displacement along the fault to reevaluate the importance of Eocene normal faulting in orogenic collapse. Preliminary data suggests a major isothermal decompression event prior to late brittle faulting, and results will lend insight into the possible contributions of channel flow and vertical tectonics in core complex formation. Similar normal faults in the Cordillera have been linked to hydrothermal fluid flow and Ag-Pb-Zn-Au mineralization (e.g. the Slocan Lake Fault; Beaudoin 1992), but this potential has not been explored along the KRF. Examining this association will help decipher whether fault — controlled mineralization found to the north is a local phenomenon or can be extrapolated to other extensional systems within the Cordillera. Metamorphic investigations within the hanging-wall seek to delineate the extent of contact aureole zones around the Jurassic Nelson intrusive suite. This will help identify controls on local Cu-Au skarn mineralization and evaluate any future economic potential.